Keep in mind a couple things: your theme does not have to be this candy theme like ours is and you can do this with an artificial tree or a real tree. Ours is a pre-lit artificial tree, meaning that it comes with the white lights on it already. Nothing fancy or expensive, just a time saver! So, pick the tree you love and wrap some Christmas lights in the tree before you begin really decorating it. Wired ribbon that is at least 3 inches thick.Why wired ribbon? Well, wired ribbon holds the shape that you put it in while regular ribbon will loose its shape very easily. We need this tree to look good through New Year’s Day and the wired ribbon is essential for that! You will also need a variety of themed ornaments and I am NOT talking about those $5 dollar ornaments that are so beautiful but will eventually break the bank if you want to cover your tree in them! No, no, no! Inexpensive ornaments are just as beautiful when they are put together by theme and color. Trust me! So, when you’re picking a theme, try to find ornaments that fit within a range of colors. My tree has about 5-7 repeating colors in it. I also suggest grabbing about 10-15 Christmas stems or Christmas picks. These are usually in various bins at the craft store and cost practically nothing! They make a big difference on a Christmas tree though! Here are some Christmas stems that are similar to the ones I have used on my tree. I also use some lollipop ornaments similar to these as well as a few coordinating gingerbread man ornaments and, of course, donut ornaments! In addition to the candy themed ornaments, I also bought inexpensive packs of regular round ball ornaments that matched my color theme. Those are the “fillers” and I think I might have spent $10 total on those? They sparkle, add dimension, and really give the tree a finisehed look. PS- In my opinion, I think you can find ornaments for a great price at craft stores. Michaels and Hobby Lobby have an amazing variety of themed ornaments (remember, not those $5 a piece ones- just skip that isle if you’re looking to stay on a budget). Starting at the bottom of your tree and in the back where nobody really sees, attach the end of your ribbon. Using an artificial tree? Then just take a branch a clamp the ribbon into it by bending the branch. Using a real tree? Use a wire ornament hanger, undo the shape, and wrap the ribbon to the branch to keep it in place. Swirl the ribbon around the tree going upwards and, every foot and a half or so, clamp the ribbon down to a branch (using one of the ways mentioned above). Pushing the ribbon in and out of the tree creates more dimension and texture. Cut the ribbon at the top and attach it to a branch to keep it in place. 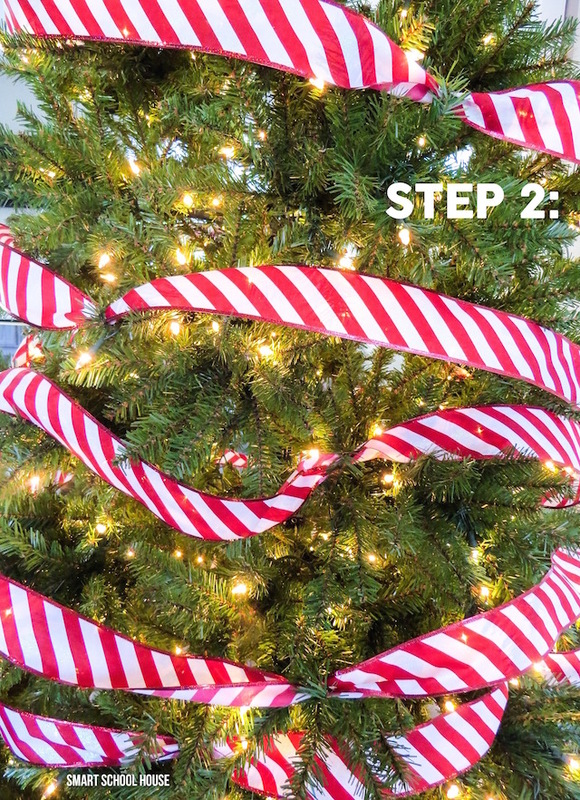 Go back to the bottom of the tree with more ribbon and repeat the process from Step 1. Yes! Swirl another layer of ribbon using that same technique up and around the tree. The more ribbon, the more decorated it will look in the end! It took me a few years to figure out that more ribbon was better:) By doing it in two sections like this, you’ll find that it is easier to make sure that the ribbon is evenly placed. I’m all about making it easy! Separate all of your ornaments into sections. For example, I put all of our lollipops together, all of our candies together, all of our donuts together, and so on. Start with your favorite section (in my case, I started with the lollipops) and put those on first. This helps make sure that everything is somewhat evenly placed. And, by “somewhat”, I mean: don’t stress over it! If you have kids in the house then things will get eventually get touched and loved, so have fun with it. Imperfect is perfect! Next, put on the regular ball ornaments. Put them on in sections by color, meaning, put all of the purple ones on first, then all of the silver ones, then all of the blue ones, etc. Finally, use the various wired stems. Put them over some of the areas where you attached the ribbon to the tree. Some of these spots might already be covered by your other ornaments, but if you have any empty spots that you’d like to cover up, add a stem! That’s it! 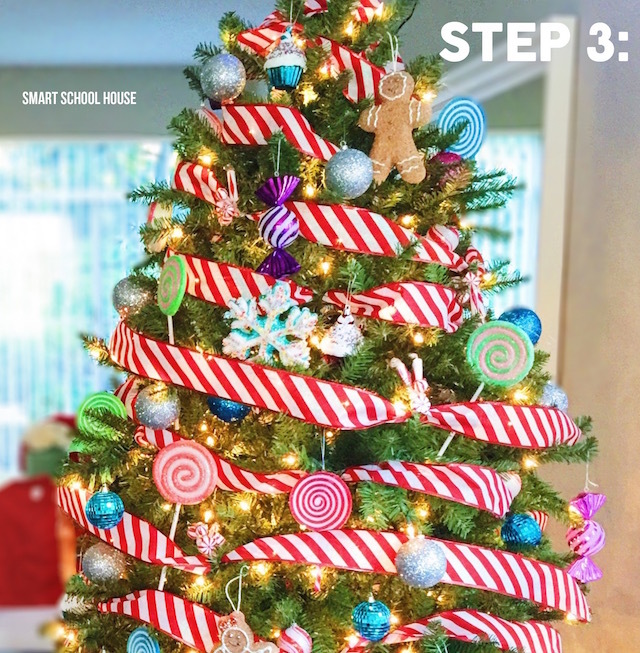 This is the easiest way to decorate a Christmas tree in 3 simple steps and on a budget! 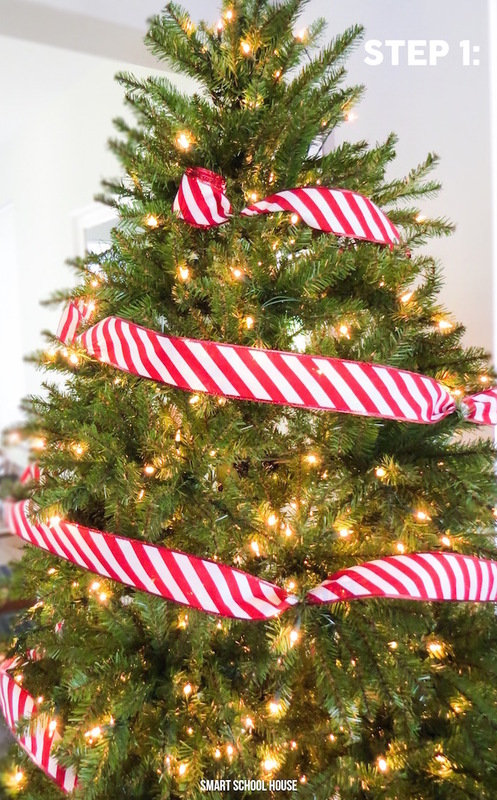 Here’s my biggest Christmas tree tip of all time: Save your ribbon and all of your ornaments!! No really, the wired ribbon will look just as perfect 3 years from now as long as you sore it. Also, add a few new ornaments that match your theme each year. For me, my tree gets fuller and fuller each year. I’m usually ready to switch my theme after 3-4 years, so just know that it is perfectly fine to add more ornaments over time (honestly- don’t break the bank! ).